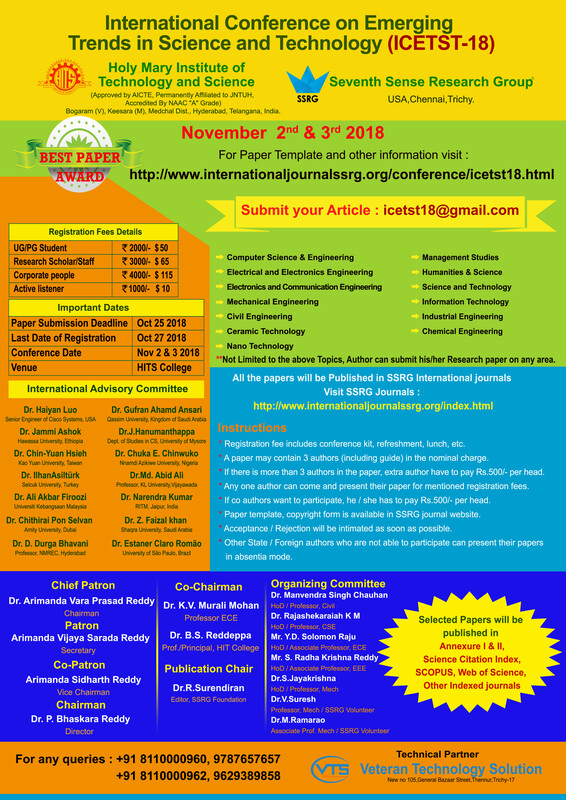 International Conference on Emerging Trends in Science and Technology (ICETST-2018), Holy Mary Institute of Technology and Science, Telangana, India. The aim of ICETST-2018 is to bring all the research areas together on a single platform. This conference will bring the research scholar communities of different fields together at one place to share their research innovation and ideas. Also the purpose of this conference is to implement the researches of one field into another to bring out the best applications of these researches. **Note- Accommodation will be arranged based on prior notice. 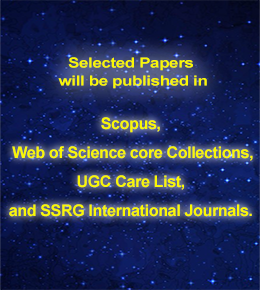 All Engineering Discipline, Computer Science, Mathematics, Management Studies, Humanities & Science, Science & Technology, Physics, Chemistry, Biotechnology, **Not Limited to the above Topics, Author can submit any subject paper. ** Registration fee includes conference kit, refreshment, lunch, etc. ** A paper may contain 3 authors (including guide) in the nominal charge. ** If there is more than 3 authors in the paper, extra author have to pay Rs.500/- per head. ** Any one author can come and present their paper for mentioned registration fees. ** If co authors wants to participate, he / she has to pay Rs.500/- per head. ** Acceptance / Rejection will be intimated as soon as possible. A medieval fort now overlooking the city, Golconda is one of the historical places to visit in Hyderabad. Originally built in mud on a 400ft hill, the fort ruins of today have seen the reign of several dynasties. Situated 11km away from the bustling urbanism of Hyderabad, it derives its name from a Telugu word meaning Shepherd’s Hill. Reminiscence of a well-planned Golconda city within the fortress limits is evident even now. The epic signature of the city, Char Minar makes for a wonderful sight. Located in the heart of Hyderabad’s old city, surrounded by Mecca Masjid, built using bricks from Mecca and Laad Bazaar - a boisterous shopping street, this landmark is laced in history. Built in 1591 by Muhammad Quli Qutub Shah, it was constructed to commemorate the founding of Hyderabad and also to ward of a deadly epidemic that was rampant then in the Golconda region. Graced by 4 minarets soaring almost 50ft in height, it has a mosque and 45 prayer spaces. One of the temples to visit in Hyderabad is the Shri Jagannath Temple, a modern day temple built by the local Oriya community over here. This replica of the original in Puri draws devotees with its sanctum sanctorum housing statues of Lord Jagannath, and his siblings Lord Balabhadra and Devi Subhadra. The spectacular temple is well constructed with an attractive Shikhara measuring 70ft in height. A true representation of the original, the construction in red sand stone is a visual marvel and is known for its annual Ratha Yatra. Located on the south end of Hussain Sagar Lake, the Birla Mandir is an enchanting modern temple built atop the Kala Pahad, the twin hillock of the Naubat Pahad. With mixed architectural styles from Odhisha and South Indian, the place of worship is embellished with exotic epic scenes from the Ramayana and Mahabharata that are finely sculpted in marble. The inner shrine of the temple has an 11ft tall replica of Tirupati Venkateswara. Certainly one of the places to visit in Hyderabad with family, Ramoji Film City makes its way to every traveller’s list because of its magical theme around cinema, which is the most common love of every Indian. The only one of its kind in India, this holiday destination offers something special to everyone. One of the best-rated science institutions world-over, the Birla Science Museum is amongst the busiest and most attended places in India. It provides wholesome exploration of science and its various arms with a planetarium that uncovers several mysteries of the universe. A unique Participatory Science Museum with Archaeology and Fine Art sections is a huge draw. One of the largest man-made lakes in India, Hussain Sagar Lake has been adorning the twin cities of Hyderabad and Secunderabad since 1562. A tourist destination that cannot be missed as places to visit in Hyderabad with family, the lake is best to spend time around dusk with pleasant air filling the surroundings. Adding to its charm is the monolithic statue of the Buddha installed in the heart of the lake. Several facilities around the lake periphery such as boating and water sports, and the neighbourhood Lumbini Park, an amusement park are add-on attractions.